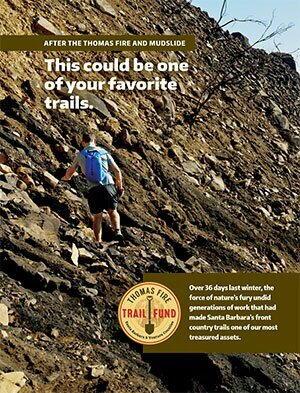 Santa Barbara Mountain Bike Trail Volunteers collaborated with Montecito Trails Foundation for today’s work. MTF hired a trail builder to rebuild the trail, Doug Hulett. He has done a ton of great work and has rebuilt the trail from the top of West Fork to the East Fork intersection with a mini excavator and many other tools. He prepared the crew leaders with a few projects and then we took it from there with leadership from Lauren. We hiked in 0.2 miles and began (where the ride line on the map is). The majority of the work was done over the next 0.8 miles–from the start of the switchbacks to the old concrete water tunnel.